GolfTEC -- the world leader in golf lessons and largest employer of PGA Professionals -- is supporting PGA REACH, the charitable foundation of the PGA of America, by offering one complimentary lesson to anyone who first makes a small donation to the foundation. CENTENNIAL, Colo. -- GolfTEC -- the world leader in golf lessons and largest employer of PGA Professionals -- is supporting PGA REACH, the charitable foundation of the PGA of America, by offering one complimentary lesson to anyone who first makes a small donation to the foundation. Redeemable at all participating GolfTEC locations in the United States between Nov. 7-13, interested parties can sign-up online at PGAREACH.com/GolfTEC. To complete the process, customers simply follow instructions on making a donation and must show their receipt upon arrival at GolfTEC. Each 30-minute lesson is valued at more than $50 and individuals are asked to make a $25 suggested minimum contribution, but can donate more, if preferred. Through the game of golf, PGA REACH fosters inclusion and positively impacts youth, military veterans and diverse communities. Aligned with the PGA’s 41 Section offices and charitable partners, PGA REACH leverages the game of golf to make a difference in the communities it serves. Highly efficient and boasting a 96 percent success rate, GolfTEC lessons are taught one-on-one by Certified Personal Coaches, mostly in indoor bays that utilize proprietary teaching technology. Developing a comprehensive improvement plan for each student is the foundation of GolfTEC’s philosophy. This is embodied by the company’s popular game plans and lesson packs, which are available in a variety of options to suit all budgets. GolfTEC has taught more than 6 million lessons at over 200 locations worldwide. Committed to strengthening the industry and hiring only the best staff, GolfTEC coaches are comprised of experienced professionals, most of whom have taught thousands of lessons. Each goes through a rigorous multi-week certification at GolfTEC University, including continued advanced training to master the analysis of golf swing mechanics, the technology of the GolfTEC system and the most productive teaching techniques. Each GolfTEC student undergoes a Swing Evaluation to assess their skill, followed by a certified personal coach recommending a specific game plan, which includes fundamental elements like course strategy and a TECfit® club fitting session. While the majority of lessons are taught indoors in private bays, coaches also accompany players for on-course/outdoor lessons to ensure they are comfortable in real world situations. To learn more about the GolfTEC PGA REACH promotion, please visit www.golftec.com/PGA-Reach-2016 or call 877-446-5383. In a clip to tease the upcoming "30 for 30: Hit it Hard" mini-documentary on ESPN Nov. 1, John Daly reveals that on at least one occasion that he can remember, he drank during a PGA Tour round. A couple of weeks back, we told you about the much-anticipated "30 for 30: Hit it Hard" mini-documentary on John Daly that will air on ESPN at 8 p.m. ET on Nov. 1. Well now, we have our first look at a small portion of the show, where Daly -- who has struggled with alcohol addiction -- talks about how he never drank during a tournament round... except, maybe, once. Clearly this is no laughing matter for someone who has had issues with alcohol. The admission, however, is what has made him a fan favorite through the years -- he's a star with struggles that the common people can relate to. This show is going to be must-see TV. When it comes to cutting a promo for a golf tournament, no one does it better than the WGC-HSBC Champions in Shanghai. This year, the creative team over in Shanghai didn't disappoint. They've released a series of videos on their social media accounts casting players like Rickie Fowler, Dustin Johnson and Bubba Watson -- among others -- as superheroes. Alignment sticks are an excellent tool to use while working on your golf game... unless you miss your intended path like Alvaro Quiros did over the weekend. Alignment sticks are a fantastic training tool when you're working on your golf game. Or, they can ruin your equipment. OK, that last sentence might be a little harsh, but it's exactly what happened to Spain's Alvaro Quiros during a practice session at the Portugal Masters over the weekend. While attempting to work on his swing plane, Quiros missed his plane and connected squarely with fairway wood to alignment stick. Practice isn't always pretty. Kudos to Quiros -- a six-time European Tour winner -- for posting this video to his Instagram account. Quiros has struggled with his game most of this season. His lone top 10 on the European Tour was a T4 at the Omega Dubai Desert Classic back in February. His next-best finish was a T24 at the Shenzhen International in April. Hopefully he's on track to getting things worked out soon. 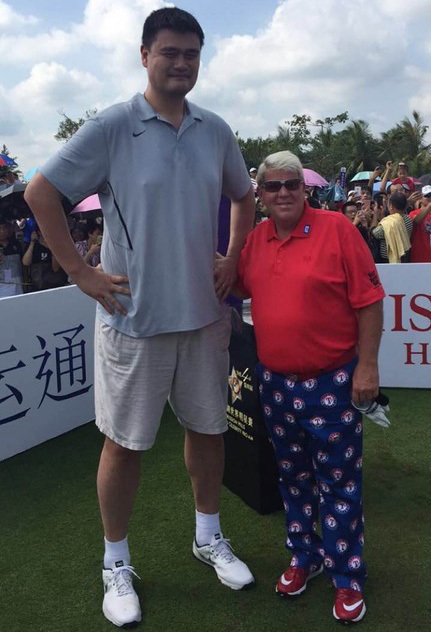 Former NBA superstar and current world's tallest golfer Yao Ming displayed his golf skills at the Mission Hills World Celebrity Pro-Am in Shenzhen, China this past weekend. It's hard to imagine being 7 feet 6 inches tall. Personally, I'm not sure I could even walk around without tipping over, let alone swing a golf club. But for Yao Ming, golf has become an activity he has enjoyed frequently since his retirement from basketball. The eight-time NBA All-Star's pitching wedge is reportedly 45 inches long, an inch longer than most player's driver. While his golf swing may not be ideal, can you imagine how far he would hit it if he took some golf lessons with a bomber like Dustin Johnson? Wow. Yao also took time to do what he does best, which is making people look miniature in pictures. Here we see golfing legends Gary Player and John Daly. John Daly also posed for a picture. And this one looks like Daly, listed at 5 feet 11 inches, is standing beside a supersized statue of Yao Ming, rather than Yao himself. 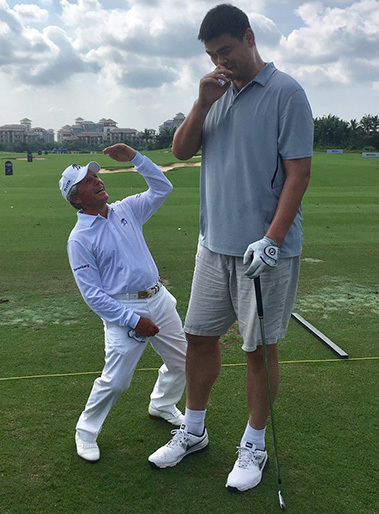 Watching the giant from China adopt Daly's swing would sure be a lot of fun to watch.